Open-E Data Storage Software V7 SOHO (Small Office Home Office) is a free data storage management OS which delivers functionalities of a fully featured NAS/SAN platform with 4TB capacity license, optional support and commodity hardware support. Open-E Data Storage Software V7 SOHO (Small Office Home Office) is a free data storage management OS with 4TB capacity license free of charge. It delivers functionalities of advanced NAS/SAN software platform, with support for multiple file protocols (SMB, NFS, AFP, FTP), enabling to build cross-platform solutions and iSCSI Target functionalities, along with enterprise features like bonding, volume snapshots and file replication. Licensed storage capacity can be increased easily thanks to cost-effective storage extensions of 4, 8, 16 or 32TB for flexible scalability. The maximum capacity of the software is 36TB. Open-E DSS V7 SOHO brings great performance, extensibility and reliability, and is out of the box tuned to provide high data-throughput and data protection for centralized storage. 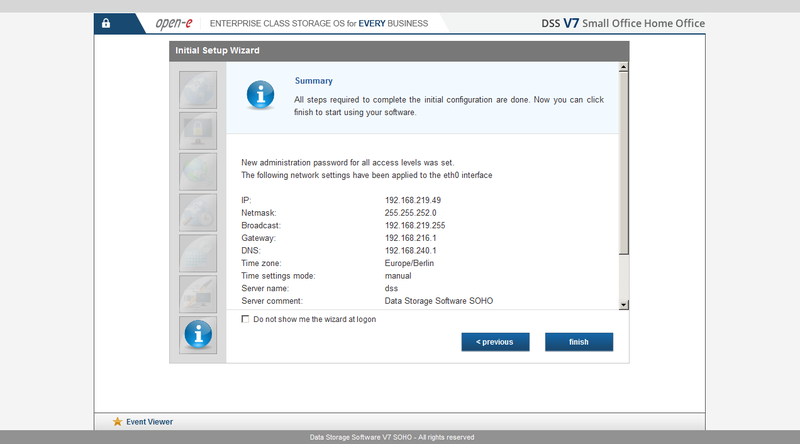 With Open-E DSS V7 SOHO there is no need for an additional operating system. Additionally, it turns any commodity server into an enterprise data storage appliance. There are no specific requirements in regard to hardware, as it usually is in many integrated solutions for small / home office use, where vendors are combining their software with lower-quality hardware to keep a competitive price. To ensure quick help for end-users, Open-E DSS V7 SOHO contains an affordable support option for the product. Thanks to the special Single Case Basic Support, all technical problems are solved by means of e-mail assistance. Additionally, Open-E offers many free resources for technical support such as a forum, knowledgebase and other free documents and videos on available on Open-E website. What is more, it is possible to upgrade to the full version of Open-E DSS V7 by purchasing a full software license. To set up the software quickly, a helpful Quick Start Guide is available, providing detailed information about the installation process. This software offers a solution to users who want to record a list of software bugs in a database. Fields include title, assigned to, status, opened by, category, opened date, priority, due date, and comments. Modern ribbon-based data manipulation tool for Microsoft SQL Server. Quick database browser. SQL profiler. Master/detail views. Advanced data filtering. Export, import. Exports can be saved as jobs. DbShell console. Database diagrams. Quick and easy database administration, natively supports Oracle, MSSQL, MySQL, SQLite, Postgre SQL, MS Access, EffiProz. Main features: Creating and restoring backups. Transfer data between databases, tables and data files or edit database schema. SQLWays is a database and application migration product capable of converting stored procedures, functions, triggers, database schema (DDL), data, SQL queries, scripts and applications. Database versioning control. Generating difference scripts. Reverse engineering. Generating C# code handling DB upgrade. Handling of static data. Support for MS SQL, MySQL, Postgres, SQLite. Try MDB Open File Tool if the corruption affects Microsoft Access documents and there is no way to access these files normally. This software allows processing any version of MDB file and converting this data into a clean document of Access format. Create your own database quickly and easily. The main feature of the program - records are not in the form of rows, and in the form of cards. This method of editing the records you have not tried! AA Mail Server, from www.aamailsoft.com, is mail server sofware with dedicated database based on Windows mail server. It helps small and medium-sized companies (1~20000 accounts) to build their own webmail server and mail system easily. This site does not contain serial number, crack, keygen Open-E Data Storage Software V7 4TB SOHO serial number : serial number is the simplest type of crack. A serial number(cdkey,product key,etc) is register the program as you may already know. a crack or keygen may contain harmful software. If you cannot find the exact version you want, just give it a try. for more information read .nfo/.txt/.diz file include in zipped file.